CD review: "A Bach Celebration"
This review first appeared in the September 11, 1985 issue of The Daily Aztec. 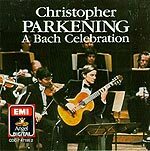 Johann Sebastian Bach composed some of the best music ever for small ensembles, and this collection of cantatas by the Los Angeles Chamber Orchestra, featuring guitarist Christopher Parkening, is a great example of the careful interplay between instruments that Bach wove into so much of his work. The selections are all religious in title, but Bach himself once wrote that "The aim and final reason for all music should be none else but the glory of God," so nearly all of his works are reverential. Parkening is a student of the great Andrés Segovia, and is nearly the equal of the master. That consummate skill of his is in best evidence on "Jesu, Joy of Man's Desiring." Parkening plays the first violin part on guitar, with the brass section handling the chorale. Despite this song having been performed and recorded to death, Parkening's full, clear playing restores the luster. Parkening is of such talent that had he recorded this album solo, the effect would still have been breathtaking. However, the presence of the chamber orchestra adds a richness and beauty that is utterly dazzling and makes this one of the best Bach recordings ever.